This is the privacy notice of Orchestre de Jeux Vidéo and https://orchestre-ojv.ca. In this document, "we", "our", or "us" refer to Orchestre de Jeux Vidéo. We are company number 1166897356 registered in Canada. Our registered office is at Montréal, Québec, Canada. By using the https://orchestre-ojv.ca you consent to the data practices described in this statement. When accessing the https://orchestre-ojv.ca website, we will learn certain information about you during your visit. This is a notice to inform you of the Orchestre de Jeux Vidéo policy about all information that we record about you. It sets out the conditions under which we may process any information that we collect from you, or that you provide to us. It covers information that could identify you (“personal information”) and information that could not. In the context of the law and this notice, “process” means collect, store, transfer, use or otherwise act on information. Orchestre de Jeux Vidéo takes seriously the protection of your privacy and confidentiality. We understand that all visitors to our website are entitled to know that their personal data will not be used for any purpose unintended by them, and will not accidentally fall into the hands of a third party. Orchestre de Jeux Vidéo undertakes to preserve the confidentiality of all information you provide to us, and hope that you reciprocate. Our policy complies with the US, & Québec law accordingly implemented, including that required by the EU General Data Protection Regulation (GDPR). If you purchase Orchestre de Jeux Vidéo products and services, we collect billing and credit card information. This information is used to complete the purchase transaction. Orchestre de Jeux Vidéo encourages you to review the privacy statements of websites you choose to link to from Orchestre de Jeux Vidéo so that you can understand how those websites collect, use and share your information. Orchestre de Jeux Vidéo is not responsible for the privacy statements or other content on websites outside of the Orchestre de Jeux Vidéo website. We will maintain the information we send via e-mail in accordance with applicable federal law. Orchestre de Jeux Vidéo may, from time to time, contact you on behalf of external business partners about a particular offering that may be of interest to you. In those cases, your unique personally identifiable information (e-mail, name, address, telephone number) is transferred to the third party. Orchestre de Jeux Vidéo may share data with trusted partners to help perform statistical analysis, send you email or postal mail, provide customer support, or arrange for deliveries. All such third parties are prohibited from using your personal information except to provide these services to Orchestre de Jeux Vidéo, and they are required to maintain the confidentiality of your information. Orchestre de Jeux Vidéo will disclose your personal information, without notice, only if required to do so by law or in the good faith belief that such action is necessary to: (a) conform to the edicts of the law or comply with legal process served on Orchestre de Jeux Vidéo or the site; (b) protect and defend the rights or property of Orchestre de Jeux Vidéo; and, (c) act under exigent circumstances to protect the personal safety of users of Orchestre de Jeux Vidéo, or the public. When you create an account on the Orchestre de Jeux Vidéo website, buy a product or service from us, or otherwise agree to our terms and conditions, a contract is formed between you and us. Orchestre de Jeux Vidéo processes this information on the basis there is a contract between us, or that you have requested we use the information before we enter into a legal contract. Orchestre de Jeux Vidéo shall continue to process this information until the contract between us ends or is terminated by either party under the terms of the contract. Except where you have consented to our use of your information for a specific purpose, we do not use your information in any way that would identify you personally. Orchestre de Jeux Vidéo may aggregate it in a general way and use it to provide class information, for example to monitor the performance of a particular page on our website. Orchestre de Jeux Vidéo continues to process your information on this basis until you withdraw your consent or it can be reasonably assumed that your consent no longer exists. You may withdraw your consent at any time by instructing us info@orchestre-ojv.ca. However, if you do so, you may not be able to use our website or our services further. Orchestre de Jeux Vidéo may process information on the basis there is a legitimate interest, either to you or to us, of doing so. Orchestre de Jeux Vidéo is subject to the law like everyone else. Sometimes, we must process your information in order to comply with a statutory obligation. Orchestre de Jeux Vidéo website allows you to post information with a view to that information being read, copied, downloaded, or used by other people. We do store it, and we reserve a right to use it in the future in any way we decide. Once your information enters the public domain, we have no control over what any individual third party may do with it. Orchestre de Jeux Vidéo and its website accept no responsibility for their actions at any time. Provided your request is reasonable and there is no legal basis for us to retain it, then at our discretion we may agree to your request to delete personal information that you have posted. You can make a request by contacting us at info@orchestre-ojv.ca. Orchestre de Jeux Vidéo attempt to moderate user generated content, but we are not always able to do so as soon as that content is published. 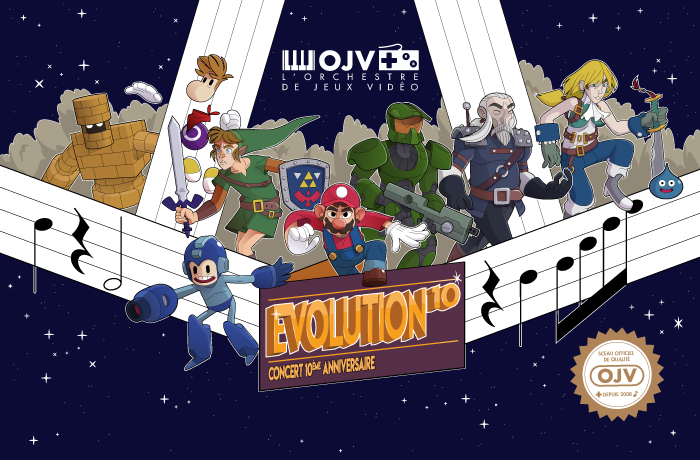 Orchestre de Jeux Vidéo is never taken by us or transferred to us either through our website or otherwise. Our employees and contractors never have access to it. At the point of payment, you are transferred to a secure page on the website of PayPal, Brown Paper Tickets or some other reputable payment service provider. That page may be branded to look like a page on our website, but it is not controlled by us. When you agree to set up a direct debit arrangement, the information you give to us is passed to our own bank Banque Nationale du Canada for processing according to our instructions. We do keep a copy. Orchestre de Jeux Vidéo keeps this information only for the duration of the direct debit arrangement. Orchestre de Jeux Vidéo is registered under the direct debit guarantee scheme. This provides for the customer's bank to refund disputed payments without question, pending further investigation. Direct debits can only be set up for payments to beneficiaries that are approved originators of direct debits. In order to be approved, these beneficiaries are subjected to careful vetting procedures. Once approved, they are required to give indemnity guarantees through their banks. Orchestre de Jeux Vidéo records your request and our reply in order to increase the efficiency of our organisation. Orchestre de Jeux Vidéo keeps personally identifiable information associated with your message, such as your name and email address so as to be able to track our communications with you to provide a high quality service. Orchestre de Jeux Vidéo may also compile statistics showing information obtained from this source to assess the level of service we provide, but not in a way that could identify you or any other person. You agree to use our website only for lawful purposes and in a way that does not infringe the rights of, restrict or inhibit anyone else’s use and enjoyment of the website. Prohibited behavior includes harassing or causing distress or inconvenience to any other user, transmitting obscene or offensive content or disrupting the normal flow of dialogue within our website. Orchestre de Jeux Vidéo undertakes to preserve the confidentiality of the information and of the terms of our relationship. Orchestre de Jeux Vidéo expects any affiliate or partner to agree to reciprocate this policy. Cookies are pieces of information that a website transfers to an individual’s computer hard drive for record keeping purposes. Cookies make using our Site easier by, among other things, saving your passwords and preferences for you. These cookies are restricted for use only on our Site, and do not transfer any personal information to any other party. Most browsers are initially set up to accept cookies. You can, however, reset your browser to refuse all cookies or indicate when a cookie is being sent. Please consult the technical information relevant to your browser for instructions. If you choose to disable your cookies setting or refuse to accept a cookie, some parts of the Site may not function properly or may be considerably slower. This site offers newsletter or email subscription services via Mailchimp and cookies may be used to remember if you are already registered and whether to show certain notifications which might only be valid to subscribed/unsubscribed users. Pages of our Website and our e-mails may contain small electronic files known as web beacons (also referred to as clear gifs. pixel tags and single-pixel gifs) that permit Orchestre de Jeux Vidéo, for example, to count users who have visited those pages or opened an e-mail and for other related website statistics (for example, recording the popularity of certain website content and verifying system and server integrity). Information about your computer hardware and software may be automatically collected by Orchestre de Jeux Vidéo. This information can include: your IP address, browser type, domain names, access times and referring website addresses. This information is used for the operation of the service, to maintain quality of the service, and to provide general statistics regarding use of the Orchestre de Jeux Vidéo website. Orchestre de Jeux Vidéo record information such as your geographical location, your Internet service provider and your IP address. We also record information about the software you are using to browse our website, such as the type of computer or device and the screen resolution. Orchestre de Jeux Vidéo collects and uses your personal information to operate its website(s) and deliver the services you have requested. Orchestre de Jeux Vidéo may also use your personally identifiable information to inform you of other products or services available from Orchestre de Jeux Vidéo and its affiliates. Orchestre de Jeux Vidéo may also contact you via surveys to conduct research about your opinion of current services or of potential new services that may be offered. Orchestre de Jeux Vidéo does not have control over these technologies or the data that these parties obtain. Accordingly, this privacy notice does not cover the information practices of these third parties. To obtain a copy of any information that is not provided on our website you may send us a request at info@orchestre-ojv.ca. If you wish us to remove personally identifiable information from our website, you may contact us at info@orchestre-ojv.ca. 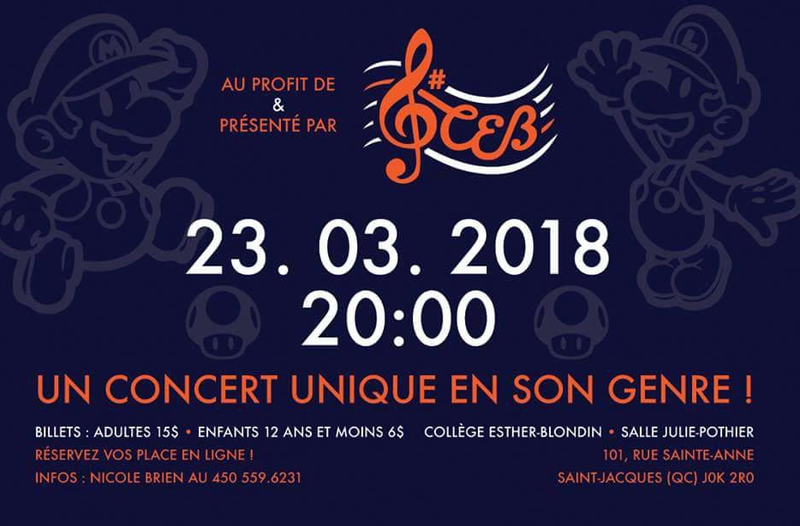 Orchestre de Jeux Vidéo does not knowingly collect personally identifiable information from children under the age of thirteen. If you are under the age of thirteen, you must ask your parent or guardian for permission to use this website. Orchestre de Jeux Vidéo does not sell products or provide services for purchase by children, nor do we market to children. Orchestre de Jeux Vidéo collects data about all users of and visitors to these areas regardless of age, and we anticipate that some of those users and visitors will be children. Orchestre de Jeux Vidéo website uses Secure Sockets Layer (SSL) certificates to verify our identity to your browser and to encrypt any data you give us. Orchestre de Jeux Vidéo makes no representations, warranties, or assurances as to the accuracy, currency or completeness of the content contain on this website or any sites linked to this site. Email is not recognized as a secure medium of communication. For this reason, we request that you do not send private information to us by email. However, doing so is allowed, but at your own risk. Some of the information you may enter on our website may be transmitted securely via a secure medium known as Secure Sockets Layer, or SSL. Credit Card information and other sensitive information are never transmitted via email. Orchestre de Jeux Vidéo may use software programs to create summary statistics, which are used for such purposes as assessing the number of visitors to the different sections of our site, what information is of most and least interest, determining technical design specifications, and identifying system performance or problem areas. Orchestre de Jeux Vidéo may update this privacy notice from time to time as necessary. The terms that apply to you are those posted here on our website on the day you use our website. We solely advise you to print a copy for your records.